Want to finally hide your cat's obnoxious litter box behind closed doors or just give them safe access to other parts of the home with closed doors? Here's a fun solution. 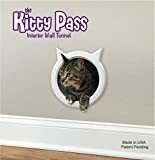 The cool new Kitty Pass is probably the most adorable interior cat door passageway ever made. With its decorative trim and cat ears on the front side and tail on the back, it almost looks like it's straight out of an old cartoon - kinda like a bigger version of a cartoon mouse's door. It features a smooth wide opening, can be used by all cats up to 20 lbs AKA no super fat cats, and easily fits all standard interior doors with sizes 1.25" to 1.75" thick.